OTEP , ONE-EYED DOLL and PICTURE ME BROKEN. 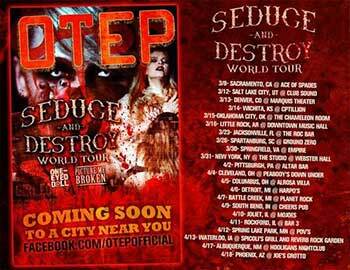 OTEP headlining the Seduce and Destroy tour beginning March 8th in Sacramento, California just after the 2013 release of Hydra with main support from ONE-EYED DOLL and PICTURE ME BROKEN. Local Sacramento fan favorites, Fair Struggle, open up the Sacramento show to the energetic cheers of the near-capacity crowd.